Vaniqa, also known as eflornithine hydrochloride, is a cream used to remove facial hair in women. We recommend that any potential underlying causes of the hair growth (such as polycystic ovaries or responses to medications) are ruled out before using this treatment. Can I buy Vaniqa (eflornithine) online without a prescription? We can prescribe Vaniqa (eflornithine) for you online if it is appropriate. Vaniqa will be sent out to you for next-day delivery in the UK free of charge. Next day delivery is also available for other European countries. How does Vaniqa (eflornithine) work? Eflornithine works by slowing down the growth of facial hair in women. Specifically, eflornithine acts by blocking the enzymes in the hair follicles responsible for hair growth. Patients normally notice results within 2 months. If no improvement is noticed within 4 months then we will recommend cessation of treatment. How is Vaniqa (eflornithine) used to treat facial hirsutism? For Vaniqa to work optimally, wash and dry the area in question thoroughly with water and then apply the cream sparingly in a thin film until it is absorbed into the skin. You can apply a small amount of eflornithine twice a day. You may apply make-up over the cream after around 5 minutes and should wait at least 4 hours before washing the area of application. Using Vaniqa reduces how frequently you perform your removal techniques such as plucking, shaving or laser, resulting in greater convenience. Are there any side effects of Vaniqa (eflornithine)? All medications have potential side effects but most people do not get any side effects whatsoever. The most common side effects with Vaniqa are skin irritations such as stinging, burning, or tingling, skin redness, rash, acne, and inflamed areas of the skin containing in-growing hairs. 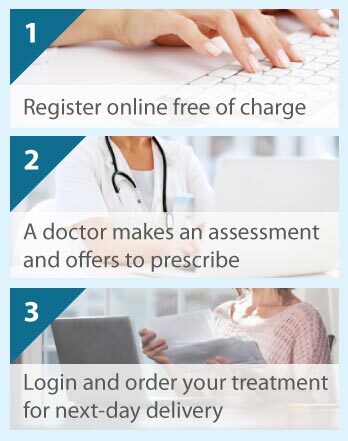 In our experience, very few patients experience any side effects at all but you should let us know if you do get side effects on your progress report that we require patients to complete if we prescribe anything. Can anyone use Vaniqa (eflornithine)? Eflornithine should be used with caution if you have a liver disorder and should not be used by men, preteen girls, and by pregnant and lactating women. Please complete a consultation form and we will check whether or not Vaniqa is suitable for you. Consultations are free and without obligation.